GOYANG, South Korea -- Hyundai unveiled the Kona here on Tuesday, touting the model's "high-tech" styling as a key selling feature as the brand enters the booming subcompact SUV/crossover segment later than its main rivals. Hyundai hopes to woo customers away from vehicles such as the Nissan Juke and Renault Captur with what it calls a "striking design," as well as advanced technological features for the segment such as head-up display. 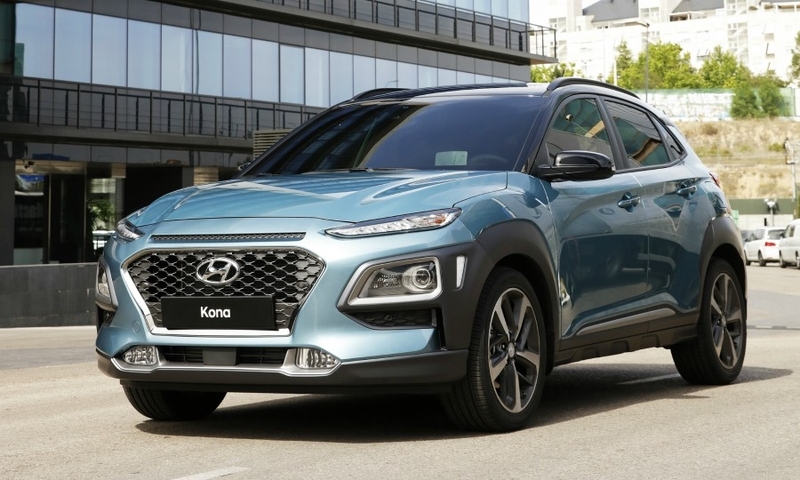 The Kona will be part of an SUV/crossover product offensive from Hyundai with the brand launching a smaller SUV by 2020 and a larger model, bigger than the midsize Sante Fe, said Hyundai Motor Vice Chairman Eui-sun Chung. The Kona will go on sale in Korea later this month with a starting price of 18.95 million won ($16,800). It will arrive in dealerships in Europe in October and in the U.S. early next year. Sales targets for a full year are 45,000 units in Korea and 150,000 for export markets. 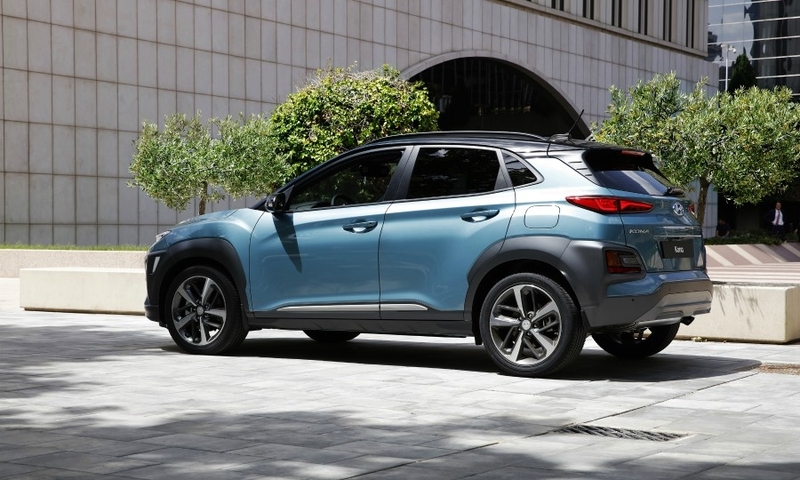 The subcompact SUV is the top-performing segment globally, growing at an annual average of 46 percent from 2010 to 2016, Hyundai said, citing IHS Automotive data. "Even as the global SUV market is nearing saturation, we believe that extra small or small SUVs have more room for growth than large SUVs," Chung said. Rather than hastily entering the market, Hyundai released the Kona after thoroughly analyzing consumers and the market, as well as the technology,” he said. The Kona will have a wide range of active safety features including a collision avoidance system which uses the car’s front-facing camera and radar to detect an imminent collision and avoid impact or minimize damage by braking autonomously. Other equipment includes lane-keeping assistance and a driver attention warning system. The Kona has a pair of thin horizontal taillights high above the turn signal housings. The Kona's European engine lineup will comprise two turbocharged gasoline engines - 1.0-liter and a 1.6-liter units. The 1.6-liter gasoline version will be available with four-wheel-drive. Next summer, a new-generation 1.6-liter diesel, also with a four-wheel-drive option, will be added. A full-electric version will also be launched globally next year with a projected range of 390 km (242 miles) on a full charge. 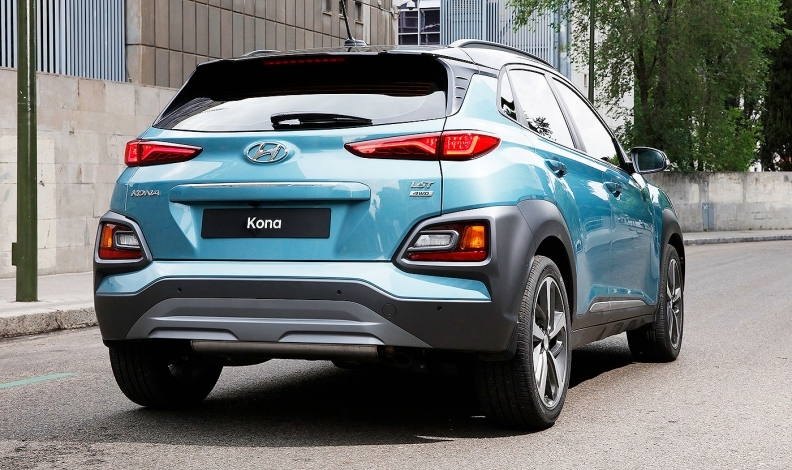 The Kona will be Hyundai's smallest SUV sold in Europe joining the Grand Santa Fe, Santa Fe and Tucson. It is 4165 mm long, 1800 mm wide with 2600 mm wheelbase. 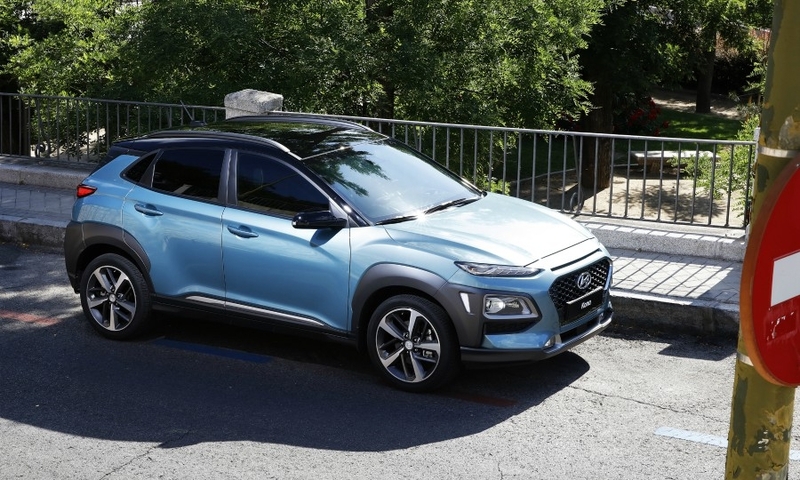 Chung said Hyundai plans to launch an A-segment SUV smaller than the Kona by 2020 and an E-segment SUV, bigger than the Santa Fe, to give the brand a full SUV lineup. The Kona is named after the lava-lined coastal district of Hawaii's Big Island in keeping with Hyundai's SUV nomenclature that is based on travel destinations. The Kona's public debut is likely to be at the Frankfurt auto show in September. 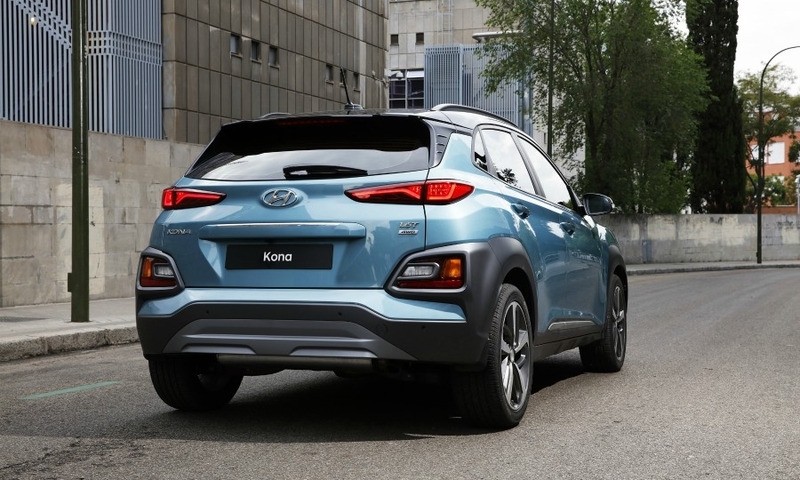 In Europe, the Kona will be an important model for Hyundai's goal of becoming the region's top-selling Asian brand by 2021, said Hyundai Europe's chief operating officer, Thomas Schmid. In the first four months, the brand was the No. 3 best-selling Asian marque with 174,444 units sold in the EU and EFTA markets as its growth slowed to 2.4 percent, while Toyota brand's sales surged 17 percent to 245,072 units and Nissan's volume increased 5.7 percent to 214,430, according to data from industry association ACEA. Hyundai hopes a product offensive in Europe with the launches of 30 new models and derivatives by 2021 will boost its sales momentum. 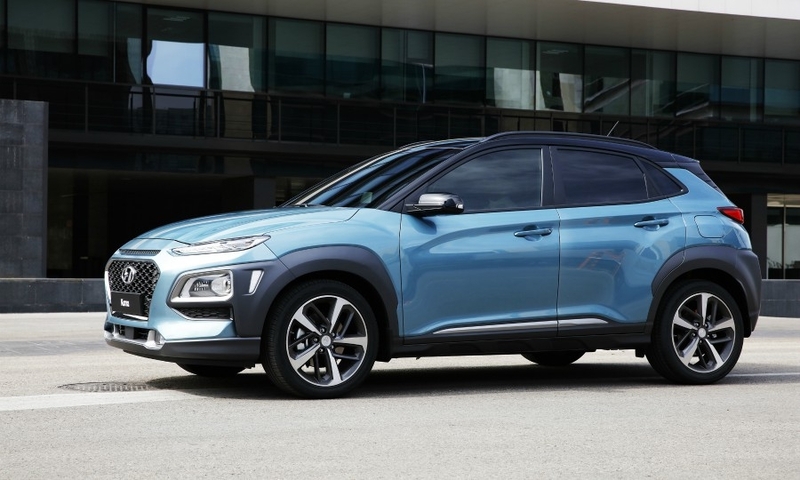 With new models such as the Kona, and its Kia sibling, the upcoming Stonic, Europe's small SUV/crossover segment is forecast to grow to above 2 million sales next year and to 2.3 million by 2020, according to market analysts at LMC Automotive.